Black humor mixed with pathos is the hallmark of the twelve stories in this adult debut collection from a master writer of comic and inventive YA novels. A young man spends a whole day lying naked on the floor of his apartment, conversing casually with his roommates, pondering the past, considering the lives being lived around him. In the odd and funny, sad yet somehow hopeful conceit of Sean Beaudoin’s story “Exposure,” are all the elements that make his debut collection, Welcome Thieves, a standout. In twelve virtuosic stories, Beaudoin trains his absurdist’s eye on the ridiculous perplexities of adult life. From muddling through after the apocalypse (“Base Omega Has Twelve Dictates”) to the knowing smirk of “You Too Can Graduate with a Degree in Contextual Semiotics,” Beaudoin’s stories are edgy and profane, bittersweet and angry, bemused and sardonic. Yet they’re always tinged with heart. Beaudoin’s novels have been praised for their playfulness and complexity, for the originality and beauty of their language. Those same qualities, and much more, are on full display in Welcome Thieves, a book that should find devout fans in readers who worship at the altar of George Saunders, Kurt Vonnegut, and Sam Lipsyte. Sean Beaudoin is the author of five young adult novels, including The Infects and Wise Young Fool. He is also a founding editor of the arts and culture website TheWeeklings.com, for which he has written more than fifty essays. Sean’s stories and articles have appeared in numerous publications, including the Onion, the San Francisco Chronicle, and Salon. He lives in Seattle with his wife and daughter. 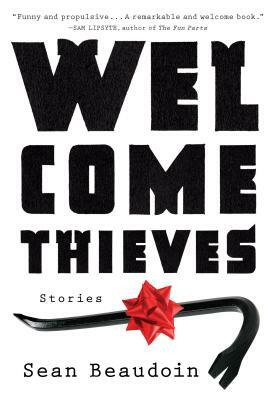 “Thrilling and mercilessly readable, the stories in Welcome Thieves go off like a string of firecrackers, sizzling and popping with a narrative velocity that is equal parts grit and polish. Beaudoin is definitely a writer to watch.” —Jonathan Evison, author of This Is Your Life, Harriet Chance!